General notes (Photo by Ed Marshall, click below for more photos) Blade only signed Sukehiro. After some study I feel stongly that this sword is gimei. However, you are free to form your own opinion. It is in pretty rough shape, though I showed it to a Japanese polisher in Tampa who said it could be restored. ???? General notes (Photo by Ed Marshall, click below for more photos) Very rare Ainu blade with original saya. General notes (Photo by Ed Marshall, click below for more photos) Wakizashi in an old saya only. There were three generations of this Yukihiro. I know the first two signed with this mei but I am not sure about the third generation. The first two generations were rated josaku and chujosaku respectively, while the third was rated chusaku. The blade is in very good condition and has some nice activity to see such as kinsuji and ara nie. There is some graying , surface scratches and a few nail draggers, but nothing fatal or detrimental. General notes (Photo by Ed Marshall, click below for more photos) Attributed to Hyuga Osumi no Jo Masahiro per the NTHK shinsa team in Tampa, FL. February 2014. Papers will be forwarded to the new owner upon arrival. While most likely made as a tanto or even o-tanto, today due to the exact length of 1 shaku, 3.73 bu or 12.375", it is papered as a wakizashi. This Masahiro was a student of Horikawa Kunihiro. General notes (Photo by Ed Marshall, click below for more photos) Well, here you are a signed Sadamune. Could it be real or could it be GIMEI ? I'm going with gimei but if you think otherwise that is your right :-). Blade is in overall good condition but has some surface scratches, wear and oxidation. General notes (Photo by Ed Marshall, click below for more photos) Wakizashi signed Nio Kiyo (remainder cut off). The shirasaya relates the following information: Niô Kiyonaga (二王清永) hachô 1 shaku 8 sun 8 bu aru kore (刃長一尺一寸八分有之) kaô – blade length ~ 56.9 cm. Attribution seems to refer to this smith: Kiyonaga (清永), Ōei (応永, 1394-1428), Suō – „Kiyonaga“ (清永), „Niō Kiyonaga saku“ (二王清永作). General notes (Photo by Ed Marshall, click below for more photos) Wakizashi signed Hishu kawachi no Kami Masahiro which would indicate the Nidai Masahiro. However, the authenticity of this mei is as of yet unconfirmed by shinsa. The Hizen schools are some of the hardest to determine authenticity on as it was such a large and prolific school. There were may student signatures as well as actual smith signatures. There appears to be some inconsistencies in the few known good mei I was able to compare it to and it may well be gimei. Though it is close, so I would have to pass and defer to a shinsa team. The sword is sound and healthy aside from the obvious surface deterioration and a few small chips and certainly needs a new polish. General notes (Photo by Ed Marshall, click below for more photos) Wakizashi with a Kinzogan mei attributing the sword to Inoue Shinkai. The quality of the kinzogan inlay is poor and the work does not match what I know of Shinkai's, therefore I am certain that this attribution is false. With that said, a new polish and this sword would be quite gorgeous. Remove the inlay and it should paper nicely. The sword is in good condition and there is a lot of activity to appreciate. There is some gray oxidation, surface scratches and a few kitte ware, but nothing fatal or detrimental. General notes (Photo by Ed Marshall, click below for more photos) Wakizashi signed Shinano no Kami Fujiwara Kunihiro Tsukuru. The shodai Kunihiro was a Saijosaku and Owazamono rated smith. Of course being a well respected name and having no papers this one would need to be sent to shinsa before I would say definitely that it was shoshin. The blade is in good overall condition. There is some oxidation, surface scratches, chips, etc. Koshirae in poor condition. This sword is technically an o-wakizashi (1 shaku, 8 sun, 6.7 bu) and only lacks 1.5 inch being a katana. However, due to it's mihaba of over 1.25" and kasane of 0.25" it feels like a katana in hand. This sword was made in the tradition of Soshu Sadamune, and has a strong, powerful sugata as one would expect. There are wonderfully cut Horimono of Suken, Bonji, Hatohoko and Futatsuji Hi. The hada is tightly forged Itame with bright ji-nie, and reminds one of Hizen Konuka Hada. The Hamon is a wide and billowing Gunome done in Nie Deki. A multitude of activity can be found within the Hamon such as nijuba, inazuma, sunagashi, kinsuji and ashi. As previously stated, this sword was a custom order and was made for "Yamano Gentaro", which is inscribed on the Ura Nakago. The Nenki or date is inscribed into the mune of the Nakago. 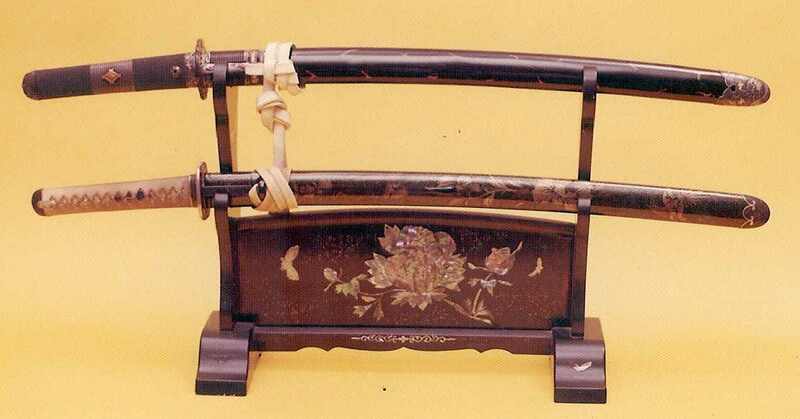 The mei indicates that Sadamitsu not only forged the sword but carved the horimono as well. The Mitsuya Mon of three arrow fletching's is carved into the nakago. A beautiful example of the quality of swords being produced in our life time. This custom order O-Wakizashi was forged by the sword smith Kono Sadamitsu. Kono Sadamitsu whose name is Kono Hiroshi, resides and works in Fukuoka Japan. He was born in 1950, the eldest son of sword smith Kunimitsu. Upon graduating college in 1975 he became an apprentice to Living National Treasure, Gassan Sadaichi. In 1980 he was given the use of the "Sada" character by his teacher Sadaichi. This was combined with the "Mitsu" character from his fathers art name. In 1981 Sadamitsu became an independent sword smith setting up shop in his home on the Island of Kyshu, in Southern Japan. 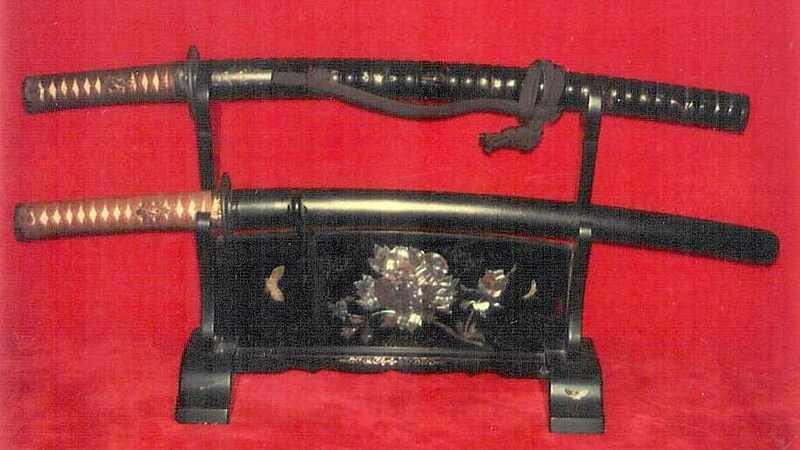 Sadamitsu enjoys working in the Soshu tradition, especially replicating the works of Sadamune, which is evident in this sword. He is also highly skilled at carving Horimono.